Search Results for "beaver dam"
1940s: Beaver dam stretches across river. Small beaver dam sits near riverside. 1940s: Beaver explores, climbs over, beaver dam. Beaver chews bark off stick. 1940s: Baby mink bites tail of another mink. Minks fight over fish, bite fish. Beaver waddles across land, past tree stumps. Beaver dam. 1940s: Beaver dam, birch trees in water. Man made dam. Slowly rotating aerial video of a beautiful autumn colored Finnish forest and flooding river caused by a beaver dam. 1940s: Man walks down dirt road in woods. Man stands next to dirt mound. Beaver dam on frozen lake. Fallen trees hang over river. Aerial Virgin River Canyon Arizona High Overhead 4K 073. St. George Utah and Beaver Dam, Arizona. Long desert canyon carved out by the Virgin River in northwest Arizona southwest Utah. 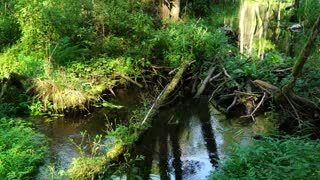 Drone footage over a beaver dam in Canada. 1927 - A canoe is pulled over a beaver dam and canoeing is shown in a narrow stream amidst grasses in the Canadian wilderness. Aerial view of winding stream from beaver dam. 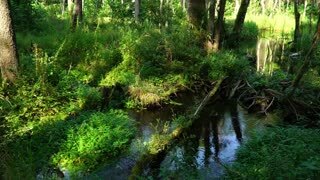 Reveal mountain stream and fisherman on a beaver dam.